So with a good amount of incredibly tasty arugula walnut pesto in my fridge I decided to give it a work out and planned a couple of meals using it. It actually could have been three, but I kept snacking on it too much. The night I made the pesto I dreamed up this little pasta dish. A majority of the ingredients I had on hand, so it made for a quick and very delicious tasting supper. You could also make this meal with regular pesto, or omit the chicken and double up on the mushrooms for a vegetarian option. Before I get started, let me point out that in this recipe I used a store bought marinade for the chicken AND a store bought alfredo sauce. I’m not opposed to short cuts in my cooking from time to time. You can certainly use your favorites in replace of mine, but I have noted what brands I used. * We used Lawry’s Herb and Garlic 30 minute marinade. Use whatever kind you prefer. ** If you’re feeling extra ambitious, you can make your own. We used Buitoni’s brand from the refrigerator section. 1. Marinate chicken 30 minutes prior to cooking – at least. Clean mushrooms, remove stems and toss in a light coating of EVOO and salt and pepper. 3. While chicken is cooling, heat alfredo over medium heat in a sauce pan. Once alfredo is heated through add the pesto and stir to combine. 4. Once alfredo/pesto is heated through, remove from heat and toss with hot cooked pasta until sauce coats all the fettuccini. 5. Slice chicken and portabellas and place on top of pasta to serve. Add tomatoes as garnish if you choose. Thoughts: This was a lovely pasta dish. The arugula didn’t overwhelm the dish because the alfredo mellowed out its intensity. They combined beautifully to make a flavorful and delicious cream sauce. The grilled chicken and portabellas were perfect on top of the pasta. You can add them in – BD likes to do this – but I don’t like to when using a long cut of pasta. I noted that the tomatoes are optional. Personally, I love fresh tomatoes on top of a pasta dish. To me it adds a light and fresh element to a pasta dish that I really love. I’ve got one more recipe to share using the pesto and I should have it up sometime this weekend. There's nothing wrong with a shortcut - especially when you end up with something like this! 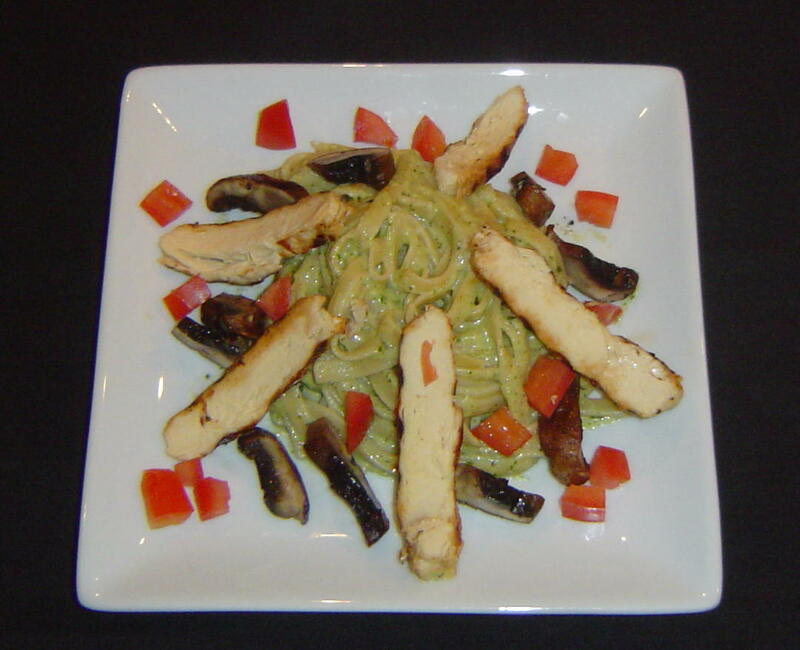 Arugula walnut pesto cream sauce sounds amazing with pasta, very yummy!